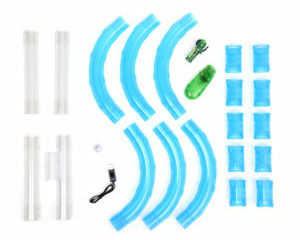 FIRST EVER toy, where vehicles speed inside pipes instead of on tracks. REMOTE CONTROLLED AND ILLUMINTATED vehicle add excitement, creating an awesome light show when room is dark. Also includes a cosmic strobe ball. 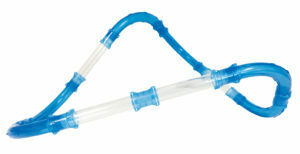 Zipes™ Speed Pipes is the first ever toy where vehicles speed through pipes instead of on top of tracks. 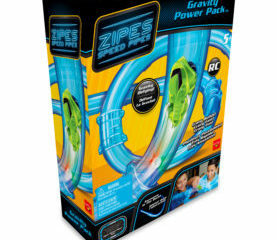 Zipes™ Speed Pipes Gravity Power Pack is just the beginning of a long journey of crazy builds and defying gravity speed. The pipes can have a single loop, many loops or you can leave them flat on the floor or even make them go up the walls – don’t be afraid to go crazy. The vehicles are illuminated – if you think the experience is fun in the light, wait to see in the dark – it’s awesome. The vehicle is RC and the included strobe ball flashes in brilliant colors which makes things even more exciting.